155 mm/52 MONARC on German Frigate FGS Hamburg. Photograph copyrighted by HDW. 155 mm/52 MONARC prototype at Rheinmetall proving range in Unterlüß in June 2003. Note the elaborate "Flexible Mounting" required. Photograph copyrighted by Rheinmetall W&M GmbH. This was an experimental program to take a German Army self-propelled howitzer turret and mount it in a naval ship. MONARC started as a joint demonstration project by Howaldtswerke-Deutsche Werft (HDW), Krauss-Maffei Wegmann and Rheinmetall W&M. 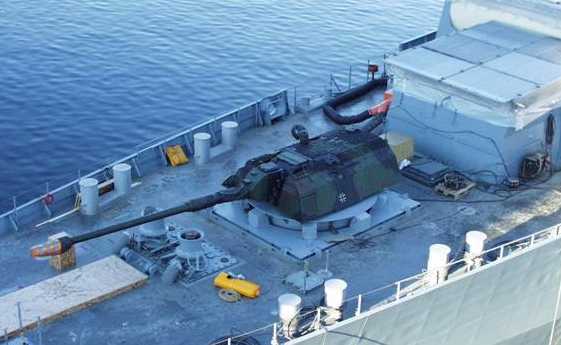 Standing for "MOdular Naval ARtillery Concept for Naval Gun Fire," this demonstration was a feasibility study for naval applications and consisted of a 155 mm/52 (6.1") PzH 2000 howitzer turret in a special "flexible mounting" installed on the deck of the German Frigate Hamburg (F220). "From the standpoint of naval architecture, the main challenge encountered in integrating the turret onto the deck of a frigate consists of having to mount a big gun onto a relatively small vessel. It is not so much the weight of the turret that is a problem: after all, the medium-calibre turrets already in place weigh nearly as much. Furthermore, the space requirement both above and below deck is no greater than that of a conventional 76 mm naval gun. The real problem lies in the effects of recoil on the structure of the ship. The necessary reduction in recoil force is to be achieved through a temporal extension of force transference by means of an elastic mounting." "By using a flexible mounting rather than rigidly fixing the turret to the deck in the conventional manner, the impact of residual acceleration on the structure of the ship during firing is expected to remain at an acceptable level. Since the turret is essentially self-sufficient, all that is required is a 24-volt power connection and a secure link to the operations room and the bridge. In addition, the ammunition storage and handling systems will have to be modified. Furthermore, in order to compensate for the movement of the ship, the gun-laying system will have to be stabilized." Land trials were successfully completed during 2003. Shipboard trials took place during 2004. The 155 mm/52 (6.1") gun used on the PzH 2000 was developed by Rheinmetall Industrie AG and has a chromium-plated barrel. It uses a semi-automatic wedge-type breech mechanism with an integral 32-round primer magazine. Gun parameters such as chamber temperature are monitored automatically. The muzzle velocity is determined automatically by means of a radar sensor and is used in the fire control computation. Modular propellant charges are used, with up to six "bags" being used per shot, depending upon the range to the target. These modular charges are said to allow faster handling, cause less wear on the gun and have a lower sensitivity to ignition hazards. The gun positioning and laying system is produced by Honeywell Maintal and is mounted on the gun cradle. The system automatically determines gun direction, position and elevation above sea level with a built-in Global Positioning System (GPS) receiver. By the end of 2002, general contractor Krauss-Maffei Wegmann had supplied a total of 185 PzH 2000s to the German Army. The MONARC turret was removed from Hamburg prior to her commissioning on 12 December 2004 and she now has a standard 76 mm Compact mounting as do her sisterships. There was some possibility that the F125 class of frigates currently being designed would use MONARC. However, an article in the April 2007 issue of MarineForum said that adapting all of the equipment in the PzH 2000 turret for the corrosive naval environment proved more difficult than expected and that it appears that MONARC has been dropped from the F125 plans. A press release by Finmeccanica dated 04 April 2007 announced that OTO Melara had been awarded a contract to arm the F125 class with the more conventional OTO-Melara 127 mm/64 LW mounting. This announcement would seem to signal the end of the MONARC program. ^A key difference for MONARC is that it uses standard NATO modular charges. This allows compatibility with land 155 mm cannons, at the cost of a slower rate of fire. Almost all current naval gun systems use single-piece cartridges with less complex handling requirements in order to achieve higher rates of fire. ^The automatic shell loading system has a pneumatically-driven flick rammer and automatic digital control, ammunition supply management and inductive fuze setting. This system can achieve rates of fire as fast as 3 rounds in less than 10 seconds. 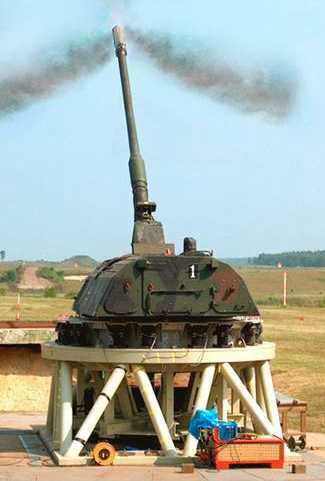 During firing tests in October 1997 with an improved autoloader, a PzH 2000 fired 12 rounds in 59.74 seconds and 20 rounds in 1 minute 47 seconds. As the barrel is not water-cooled, it would be expected that high rates of fire would significantly reduce barrel life. ^Standard NATO 155 mm (6.1") ammunition includes high-explosive projectiles, bomblets, smoke and illuminating rounds. ^The automatic shell loading system used on the PzH 2000 can handle 60 rounds of 155 mm ammunition. The Denel V-LAP (Velocity Enhanced Long Range Artillery Projectile) is a rocket assisted projectile that increases range by about 11,000 yards (10,000 m), depending upon the charges used. Dispersion is said to be similar to that for standard extended range, full bore (ERFB) rounds. Shipboard mounting only requires 24 Vdc.